If you are a loyal two-first-albums STEELHEART fan, then limited are the chances you'll dig this album. Not to say you shall by-pass in rich comfort. Good 2b Alive is a CD that possibly requires two major conditions: a) spend lots lots lots of time with this disc, b) consider if you can take a wider view on an artist's approach (the way e.g. WINGER fans liked - or not - Kip's solo albums). Sufficient info for a start, I guess. Steelheart (1990) and Tangled In Reins (1992) depict the Miljenko Matijevic-fronted outfit's success during the 'hair' Metal heyday in the US. Since then, loads of things did occur (the 'mainstream' decadence of the genre, Matijevic's accident in Denver, CO, the spiritual Wait album in 1996)…Good 2b Alive seems to be a Matijevic solo release the most; why did he use the STEELHEART logo, I don't know. The set of songs included present/expose an 'artist' aura, a somehow 'inner' fury transcribed in notes. Matijevic screams and shouts in wild songparts, he then worries and awaits in lower tunes, then again he outbreaks in salvation. In rather different singing formats from the expected ones, Matijevic sounds digital, industrial, 'wah wah', then again Plant-ish or in a similar way to Kip Winger's behaviour…The music is more of a modern Rock/Hard Rock vibe, with tons of mild moments, while there's an obvious reference to more ZEPPELIN-influenced pattern types, in a way I also brought KINGDOM COME's post-90s releases. Strings enrich an excessive deployment of emotional projections by Matijevic's throat or the music itself. Still, all these refer to a kind of musical creations not that supportive to the average hardrockers' wants. 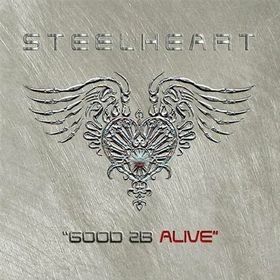 Listening to Good 2b Alive again and again, it is possible you'll start getting kinda caught in 'reborn' STEELHEART's web. Again, if you do not fancy major alterations in a band's music (especially out of the Hard/Heavy borderlines) then Good 2b Alive is not an album destined to conquer your CD player. Hence, the grade.